Today marks the launch of a new campaign at Prince’s Trust HQ. We’re celebrating everything Enterprise, as we look to encourage young adults to set up their own business. Dull, boring and disengaging? Wrong. Working with creative agency Nonsense, and funded by RBS , we’ve created three spoof infomercials bringing to life a series of terrible business ideas. You know, the ones that wouldn’t make it onto the brainstorm flip chart – despite the mantra ‘no idea is a bad idea‘. And, it works. Take a look for yourself. 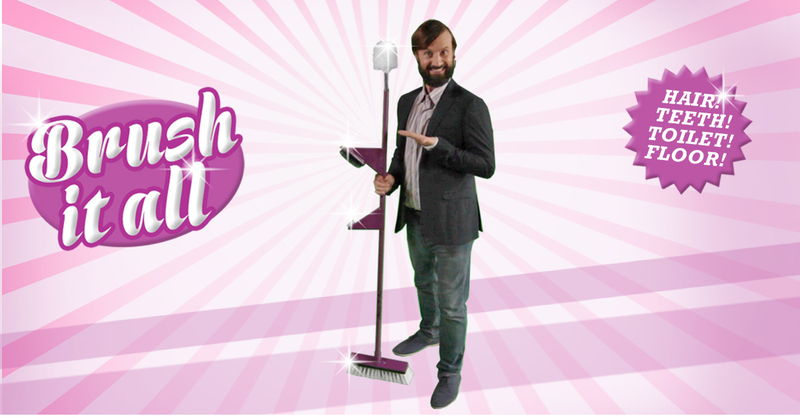 The ‘Brush it All‘ video celebrates the start of a three-week digital campaign – our biggest push ever – and to make this possible we’ve strengthened our existing business content to sit alongside the videos. From Enterprise programme enquiry forms to business plan templates, we’ve made the collateral easier to find and use thanks to our new landing page. Making the most of our campaign news hook, the PR team has also created case studies of young people who’ve previously completed The Prince’s Trust Enterprise programme and gone on to business success. To be featured on the website and sold-in to national, regional and local press, these stories will bring to life what we we’re trying to achieve and tick the box for peer to peer marketing. We’ll also be sharing the stories of the Enterprise ‘heroes’ on the other side of the coin – The Prince’s Trust business mentors who provide two year’s support to every young person who seeks to develop their business idea- to maximise coverage opportunities. This isn’t a category that I usually highlight when reviewing campaigns – especially when there’s still a debate as to whether it’s stats or celebs that people respond to more. But, with a host of celebrity ambassadors supporting The Prince’s Trust, the team has leveraged business tips from self-made figures to inspire young people. Think Kelly Hoppen , Jamal Edwards, Levi Roots and Jamie Oliver. As well as being rolled out online, this content will also generate consumer coverage. We’ll also be engaging with the celebrities on our social media channels. But, it’s not just a case of us, or them, pushing the video out with a campaign hashtag (although, not to leave any stone un-turned we’ve got one of those as well: #MyBigIdea), we’re using YouTube, Twitter, Facebook, LinkedIn, Instagram Pinterest and Google+ to share exclusive ‘behind the scenes’ content and connect with followers by feeding into business-related conversations. So, with all of this, a dash of digital advertising, e-marketing, and internal comms, we’ve come up with a recipe for success. What do you think? Does Brush it All inspire you to start your own business? Drop me a comment with your thoughts and continue to check YouTube for the other videos in the series over the coming weeks. They’re awesome. Jamaica‘s motto is ‘out of many, one people‘ and it’s never rang truer than this week. The lush Caribbean island has qualified for the two-man bobsleigh event at next month’s Sochi Winter Olympics. 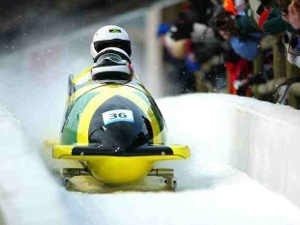 That’s right – Cool Runnings is becoming a reality (again). But one thing almost stood in Winston Watts and Marvin Dixon’s way – money. The funding was so tight they had to dip into their own pockets and even watched the final qualifying round from home with bated breath to see it they’d made it through to the next round. But, once again, Twitter has proved itself as the key driver for crowd-sourcing success. @JamaicaOlympics backed its athletes by drawing attention to a unique crowd-funding initiative on the micro-blogging site moments after the pair qualified. And, although each tweet didn’t generate mass re-tweets or favourites, they’re being seen by the right people. Most of those people used internet currency sensation Dogecoin to generate the much-needed cash – and in doing so it’s boosted the value of the crypto currency. So I predict we’ll be hearing more about it, and it’s rivals, in the coming months. The great news is that tonight it was revealed that, thanks to a blend of individual and corporate doners, the team raised $25,000. This flurry of national PR has meant that Watts and Dixon have dominated news articles as well as the sports pages – including The Guardian, Metro and the New York Times to name a few. And hopefully it’ll encourage the world to find the remaining $15,000 to get Jamaica to the Games. The team’s fundraising success is testament to @JamaicaOlympics upping its game, while the sporting world was asking questions about the island’s novelty team. It’s gone from tweeting once a day to every hour; re-tweeting key stakeholders; and increasing its level of call to actions. Accompanied by a thriving website, team blog and Facebook page – Jamaica’s got the full social media package. 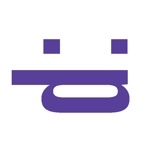 Our survey says… more please! Welcome Prime Timers – to the first blog of the new year. If you’re struggling with the thought of the five-day working week, then this blog probably won’t help. I’m going to get underneath the skin of a recent survey and debate the PR-Journalist-Consumer relationship. That’s right folks, we’re exploring a three-way relationship. The Energy Saving Trust has commissioned a survey which reveals that more than half of consumers prefer to see advertising claims backed by facts and figures. A further 41% are more likely to believe ideas supported by a third party expert organisation. ‘This is interesting’ I hear you say. But you’ll be even more surprised when I say just 1% said celebrity endorsement would increase their product loyalty. So, judging by this report, big brands such as Nike, Pepsi and L’Oreal should scrap Ashley Cole, Beyonce and Kirsten Dunst and re-invest their budget elsewhere, because apparently it doesn’t work! From a PR point of view, what avenue you go down to get coverage depends on who your target audience is. Top titles such as the Metro and the Daily Mail are packed with survey stories, but you can’t have a conversation with a lifestyle journalist without a celebrity partner as back up. That’s because celebrities don’t just push product, they market an experience. Are the research respondents actually telling me that when they’re looking for trainers they’re turned on by Which? statistics rather than the thought of looking like a model? Which sectors should prioritise stats? I’m not expecting consumers to believe everything celebrities say. We’re in the middle of a sponsorship era. Do well in youe field, you get offers. Lie, cheat or fail to perform and those offers are taken off the table. So, media savvy readers will know that celebs will agree with almost anything as long as it pays well. These endorsements are PR through and through. In some cases, celebrities can’t even uphold an exclusive sponsorship deal. In the Evening Standard tonight I saw that in an interview with the Radio Times, actor Ben Miller has admitted to fancying Typhoo Tea opposed to PG tips. He’s rocked the boat and put his personal opinion above his cash cow. Which sectors shouldn’t prioritise stats? But, when it comes to securing coverage, it takes far longer to explain your headline stat and sample size, compared to uttering the words ‘Gwyneth Paltrow‘. And, more often than not, she adds more weight. I’ve actually had a journalist put the phone down on me, not because he wasn’t interested in my pitch but because he simply didn’t believe the figures. There’s a time and a place for numbers and percentages. When they’re unusual, fool-proof and complement the product or service, they sit well with all everyone involved. But, if in doubt, find someone who will communicate your messages without the hassle.